One of the NHL's rare undrafted captains, Mark Giordano's life made him the perfect choice to lead the Calgary Flames. CALGARY, Alberta — Before the engine sputtered in oil country and the Calgary Flames lost nine times in 10 games, before they bowed out from the playoff race by flipping two veterans at the NHL trade deadline and fell even further in the Western Conference, Mark Giordano surveyed the rocky voyage and decided that his team needed someone calm at the helm. As one of only two undrafted captains in the NHL (New Jersey’s Andy Greene is the other), and the owner of a winding tale that took him across the globe and back, Giordano has never been prone to panic. He already carried an intense competitiveness that was honed while he was growing up outside Toronto. Two years in juniors, one in the AHL, one in Russia and one collegiate false start, all without hearing his name called at any draft, taught the defenseman to trust himself. The tragic death of his sister when Giordano was a teenager steeled him for more trivial challenges. “A relentless, no-quit attitude,” Flames director of player development Ron Sutter says. For these traits, even before Flames brass confirmed his captaincy in Sept. 2013 with a “very short meeting,” as head coach Bob Hartley describes it, Giordano seemed ideal for the job. Today, sitting in his locker stall after practice, right underneath the sign that announces IT IS IMPOSSIBLE TO BE RESPONSIBLE OCCASIONALLY, Giordano says he admires leaders like Chicago forward Jonathan Toews (“They call him serious all the time, but I think that’s a great quality for him to have”) and Tom Brady (“I guess shoot for the stars, right? Look at the best guys out there.”). He roots for the Green Bay Packers and has recently taken to UFC fighter Conor McGregor, even though the Irishman is “loud and chirps a lot.” The 32-year-old Giordano, on the other hand, says little in the locker room, which is why incoming prospects are instructed to quietly pay attention to him. Yes, the building process is ongoing up there. Foundational pieces like Johnny Gaudreau, Sean Monahan, Sam Bennett, T.J. Brodie and Dougie Hamilton are locked into place, but Calgary has stepped back in the standings after reaching the second round last season. (Currently, the Flames rank 28th in points percentage, 29th in goals-against, last in penalty killing, and 22nd in even-strength shot attempt differential.) During last spring’s postseason run, which ended in five games against Anaheim in the conference semis, Giordano watched while nursing that bicep injury. Hartley believes that if Giordano hadn’t gotten hurt, he would have “run away with” the Norris Trophy. They also believe that Giordano has the mettle to steer Calgary ship toward whatever comes next while learning how to lead along the way. Giordano remembers the day, but prefers to avoid specifics. He was 14. Mia was 20. He was at home. His parents were there. The phone rang. An accident on Wilson Avenue. A Honda Civic, carrying Mia in the passenger’s seat, collided with an SUV. She was pronounced dead at the scene. He thinks about her most during the national anthem, which means when U.S. teams play Canadian ones, like on Feb. 15 against Anaheim, he has twice as much time for reflection. He stands at the blue line, head bowed. He sways from side to side, stick at his hip. He reminds himself to relax. It helps calm his nerves. “It’s been a long time now but it doesn’t feel that long,” Giordano says. “It feels like it happened recently. Sometimes when things aren’t going well and you’re beating yourself up about hockey, really this game you’re playing, you put it into perspective and see that life really is short. Four years afterward, Giordano enrolled at York University, a few clicks north of Wilson Avenue. He had just finished two seasons with the OHL’s Owen Sound Attack and was prepared to use his junior hockey benefits to attend college. Maybe he could extend his career, but mostly the degree would steer him into the real world. He met the hockey coach. He picked courses. “Business 101 and Accounting,” he says. “Those are the only two I can remember.” Then an invitation came. The Flames wanted him at their development camp. Searching for the over-age and the late-blooming, Calgary scout Tom Webster had located Giordano and recommended his inclusion. 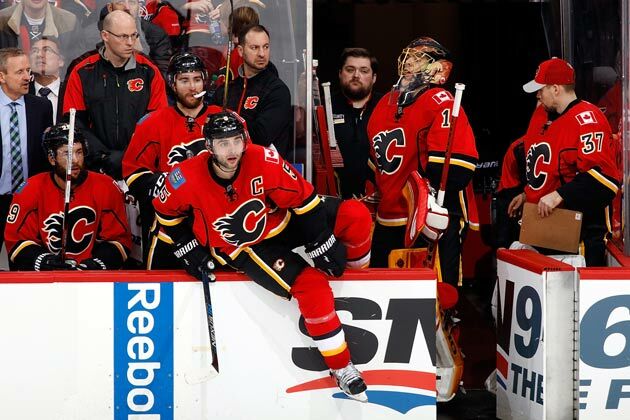 At the time, Giordano wasn’t a strong skater but the Flames admired his attitude. “I think at the time, he was just looking for an opportunity,” says scouting director Tod Button. And at camp, Giordano impressed enough to earn an entry-level contract. “I remember seven guys signing the same deal and Darryl Sutter pulling us all in and saying we have equal opportunities for all of you,” Giordano says. “We don’t care if half of you are undrafted; we’re going to take the best players and call them up." He never ended up attending York. After one season in Lowell, one in Omaha and 55 games with Calgary between 2005 and 2007, Giordano reached a crossroads. He wanted a one-way extension but the Flames were only offering two-way opportunities. At the time, Giordano considered himself “a bubble guy, a 6-7 guy at best” in the NHL, but also “needed to take care of myself financially as well.” So he signed in the KHL at 24 years old, moved to Moscow, spent a season abroad and, in the strangest twist, returned to the Flames—no questions asked, no hard feelings. “Looking back on it, it was more of a risk than I thought at the time,” Giordano says. “Taking a year, going away from a year opens up the door for other players to come in and solidify themselves in the organization, it opens up the door for getting hurt over there. I just went with it. Glad it worked out. I think I became a better player playing a lot more, a different style of hockey, bigger ice. The game against the Ducks goes like many others. Calgary’s top line—Gaudreau, Monahan and the since-traded Jiri Hudler—produces nine points. At even strength, Giordano and Brodie enjoy strong possession nights against Anaheim’s heavy hitters. The Flames score four goals for the 17th time this season. But they also allow at least five for the 11th time and lose, 6–4. Two days later, they drop a third straight, 5–3 against the Minnesota Wild. After the game, Giordano stands at his stall, underneath the sign about responsibility, and addresses what he calls “an uphill battle.” He laments unenforced errors and the three-goal hole that Calgary dug. He answers questions about the game for one minute, then spends the next 30 seconds addressing the NHL’s upholding of Dennis Wideman’s suspension for blindsiding a linesman, which landed that afternoon in Commissioner Gary Bettman’s 22-page ruling.